Today is about inspiration. Inspiration for me comes from several different areas in my life depending on what I am searching for at the time. There are movies that inspire me to center my life back away from my ego. I have artists that inspire me to paint and writers that inspire me to write. Inspiration comes from all directions if you’re looking for it. Like anything else though you have to be open in your heart to receive it. My kids inspire me to be a kid. You know the days where you didn’t worry about many things in life. Laugh a lot and enjoy life. My wife inspires me to be a better person. If you have read the book , then you know how much she means to me and how she has blessed my life. They allow you to see a gracious heart inside yourself. My inspiration for writing the next book is to further my cause in helping people see a bigger world. You have to open your heart and remove those blinders that create a narrow focus in life. So many people are surrounded by greatness yet they fail to see any opportunity. This would include me from time to time. I have learned through the experiences of accident to be self-aware. This stands as the inspiration for me to teach people. I learned very early on that you cannot force people to see a bigger world. Most of that, I believe, is self created fear. Fear of failure and fear of success can lead to false beliefs that your life is as good as it will get. I get inspired by good people. People, like my wife, that just have a great heart and want to do things for other people. They look beyond their own needs to help others. When you meet someone like that and you open your heart, they make you better. They allow you to see a gracious heart inside yourself. After the accident and the experiences that I had gone through, God inspires me. I still have a difficult time wrapping head around the experiences in the book and several others that I cut out of the final draft. God inspires my faith. God inspires my spirit and I have to remind myself of this everyday to keep the ego from being my inspiration. Folks, I will say this again, we are surrounded by inspiration but you have to be open to receiving it. So many times my wife has shown me and reminded me in tough times what we are surrounded by in our life. God has blessed us because we receive his blessings with a gracious heart. I can’t wait to share more with you on this topic in the next book. 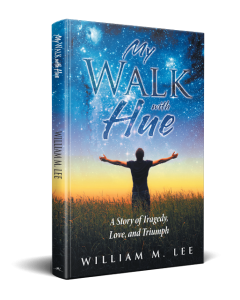 Bill Lee on My Collapse of the Four Pillars. Robbyn on My Collapse of the Four Pillars.